Hospice is, first and foremost, a philosophy that acknowledges and embraces the fact that dying is the natural conclusion to life. The role of a hospice team is to provide comfort and support to a person who is in the final stages of a terminal illness and help that person prepare for his or her eventual death with as much dignity as possible. Everyone experiences death in their own way, and there is no rigid schedule of events. 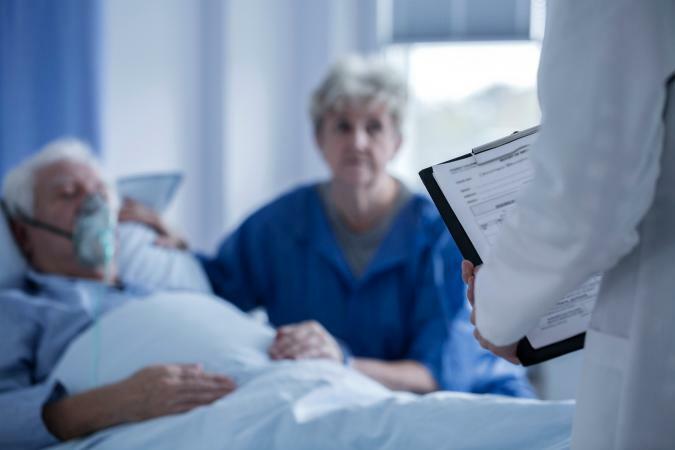 Still, there is a natural process to dying that follows a general pattern with some specific signs that help hospice workers determine that the end is drawing near. On average, the active part of dying, which is what happens at the very end of someone's life, usually lasts around three days before the person passes away. Prior to that, the body's shut down process can last anywhere from two weeks to months before the active part of dying begins. Factors that can impact the pre-active and active phases include the type of illness, types of treatment received, and quality of care. When a terminally ill person accepts the reality that she's going to die, she typically begins to withdraw from the world. It's often a slow process. She may lose interest in much of what's going on around her. She may even begin losing interest in people, even those she has been closest to. Her thoughts begin to focus inward, and she may begin refusing visitors or simply spend most of the time sleeping. She may feel less need to talk and spend more time thinking quietly to herself. Withdrawal usually begins to set in a couple of months prior to death. During this time, family caregivers should try to be supportive and let the patient have as much peace as possible. The hospice care team will evaluate the situation and recommend how to handle it. In some cases, it may be helpful for a member of the psychosocial department to visit the patient and see if there are things she'd like to talk about. She may have something on her mind, but she might not feel comfortable sharing it with her family because she doesn't want to upset them any further. Talking with a member of the hospice team may actually be a great comfort. There comes a point where a patient loses interest in food, and this is a completely natural part of the process. However, this can be very stressing to a caregiver who feels it's her duty to keep her loved one fed and hydrated. According to the Hospice Foundation of America (HFA), it can actually prolong the patient's discomfort if you try to force her to eat and drink as her digestive system is beginning to shut down. The attending physician may consider writing an order to discontinue delivering food and hydration by artificial means if it's medically warranted, and if the family, and ideally, the patient all agree. However, the family and the patient can still override that order if they wish. An order for comfort foods may be another option. This order simply allows the patient to decide what, if anything, she wants to eat. The family may also have some concern that withholding food and hydration will cause the patient even greater discomfort. However, the HFA notes that as the patient's metabolism changes, rising ketone levels in the bloodstream produce a sense of euphoria that diminishes the patient's discomfort. Disorientation and mental confusion sometimes occur as the dying process begins to affect the central nervous system. A patient may confuse a particular sound with the sound of a human voice. She may look at an object in the room and think it's something quite different. The patient may also begin to hallucinate and claim to see or hear things that no one else can. This kind of confusion can sometimes cause the patient to feel agitated. There are different ways the family caregiver and hospice worker can try to help the patient calm down in this situation. They can try talking with her and trying to reorient her. They may also try music therapy or massage therapy to help her relax. In some cases, the patient's physician may even prescribe anti-anxiety medication. There are definite changes you can easily see as the circulatory system begins to fail. The hospice nurse keeps track of these changes and relays them to the physician in charge. Although comfort care is part of the hospice mission, these physical changes won't be treated unless they are unrelated to the terminal illness the patient was diagnosed with. Blood pressure decreases and the heart rate fluctuates. The skin becomes pale or may take on a yellow pallor. It may also feel clammy. Breathing also fluctuates, becoming slower or more rapid at times. Sometimes a patient will rally before death and want to talk. She may be quite coherent, even if she had experienced some disorientation and/or confusion earlier on. She may even request something to eat or drink. This rally doesn't usually last very long, typically just a day or even less. When it's over, the patient relapses back into a deteriorating state, and the signs witnessed earlier become even more intense during the final decline. The patient may appear restless, which is usually due to a lack of oxygen in the blood. Her breathing may become very irregular, and she may even stop breathing for brief periods of less than a minute. Her lungs may become congested and develop a rattling sound when the patient breathes. She may also develop glassy eyes before death and may not see what's going on around her even if her eyes are open. Her extremities eventually take on a purplish, blotchy appearance. Hospice staff refer to this as "mottling." The patient eventually becomes completely non-responsive and slips quietly into death. 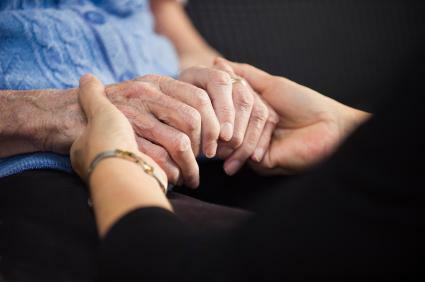 The hospice team works with the patient's family to support them as they deal with all the emotions and responsibilities involved when a loved one dies. One of the most important aspects of hospice's mission is to guide the patient and the family through the actual dying process, helping all concerned to recognize the signs of dying, what they mean, what to expect, and how to prepare along the way. If the patient is living in a hospice facility, staff will be present the entire time, although they'll give the family as much privacy as they can. 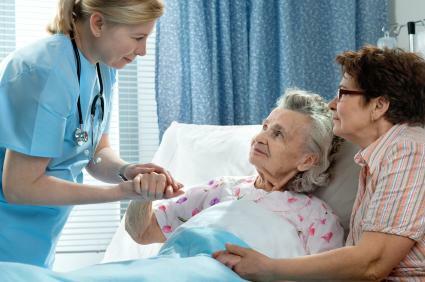 If the patient is using home hospice care, the team will rely on the family caregiver to let them know that the patient is taking a turn for the worse. Key members of the staff can then be with you during those last hours when death is imminent. In many cases, a nurse will remain with the patient and answer any questions or concerns the family might have. A spiritual advisor can also be present if requested. Gone From My Sight was written by award-winning nurse Barbara Karnes and is regarded as the gold standard in literature when it comes to end-of-life education. It comes in paperback and is also available for e-readers. In this book, Karnes discusses what to expect when a loved one is in the process of dying. This book is written at a fifth-grade reading level and is appropriate for both children and adults as a helpful resource. Some people feel that entering hospice care or enrolling a loved one is akin to giving up, but that's really not the case. The time simply comes when there's nothing more that can be done to try to cure the illness, and it's time to focus on end-of-life issues. This can be uncomfortable and, frankly, a little frightening. It's unknown territory for many people, and it's your hospice team's mission to help guide you through it. Let your hospice professionals know what you observe and let them explain to you what it all means. It's all right to ask questions and share your concerns; they are there for you to lean on. 2. Keep an open mind about what your hospice professionals are telling you. It's easy to shut down when you're going through something this momentous. A lot of the information your hospice team shares will probably not be welcome news, but you can count on them to deliver that information with honesty and compassion. As part of the service, spiritual care and counseling are also available to family members. 3. Let the team help you shoulder the burden. It can be difficult to step back and let someone else carry the burden for a while but don't hesitate to ask for help. It's important that caregivers take advantage of a little respite care so they can take some time to rest and recharge their energy. Even a few hours away from their loved one can provide some much-needed relief and fresh perspective. 4. A bereavement coordinator can help facilitate some arrangements. The hospice bereavement coordinator can help open up the discussion about funeral arrangements. Although contemplating the funeral can be quite difficult, it's usually beneficial to have at least part of the planning completed before the crisis comes. This gives the patient some control over her final arrangements, and it saves the family from having to make all the decisions while they are grieving. Each person's final journey is unique, and there's no perfect way to navigate through the process. You can only take things one day at a time and deal with the situation as best as you can. The hospice team will support you every step of the way.